I harvested my onions recently and am pleasantly surprised by how well they turned out. I experimented with growing them from seed this year, which I’d never done before, and I have to admit that I was pretty skeptical while I was transplanting those piddly little green shoots that they would ever amount to anything, but they actually did! …but these red storage onions will perk up our fall and winter meals.Speaking of experiments, I’m also trying a fall planting of potatoes. Last month I was faced with a large empty bed and a bag of sprouted organic potatoes and I thought, what the heck? So far, so good – they’re about 8-10 inches tall and look happy, I’m just a bit worried that the coming rains might do them in. I’ll keep you posted. I never get my onions to grow- especialy from seed. 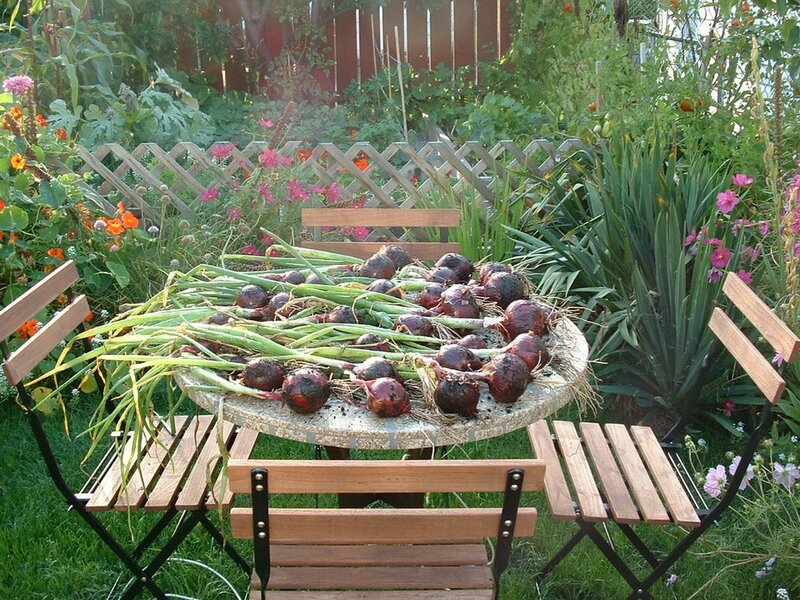 Congratulations on such a bountiful onion harvest! I hope your potatoes don’t get flooded out. Onions look good. Hi! I discovered your blog through the webring, and was pleased to find another Canadian. 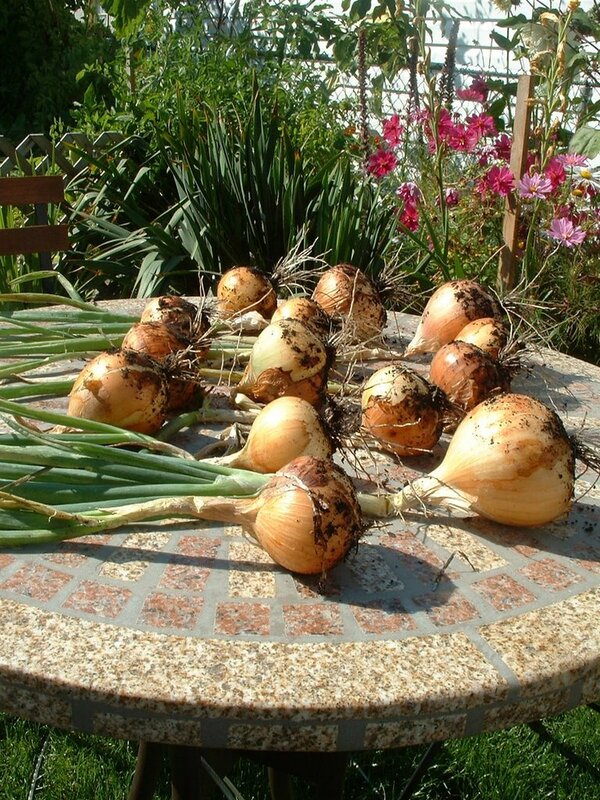 We had a great crop of onions going earlier this year, but the dratted onion flies got to them and we lost the whole bed! So I’m awfully envious of your keepers. Someone told me that banking the shoots with ash repels the flies from laying their eggs, so we’ll try that next year. Tammie – That’s such a shame, I wonder why? Phelan – Thanks, we’ll see what happens. Thistlebee – What rotten luck with the onion flies, I hope the ash works next year.